I thought he was the 23rd pick? YikesVikes wrote: Treadwell will be fine. I have seen out front office miss on talent assessments and who is ready to play to often. I believe the kid just needs reps and game time to get acclimated. Maybe he will. But this is what you have to ask yourself. Would you rather have a guy who makes the team better right away or a guy you have to work with? The Vikings have swam in mediocrity for so long just barely making it or having a shining moment briefly mostly because of their draft woes. I for one am tired of the so-so and the also rans. Aren't you? As a Viking fan I consider an insult on intelligence to put up with way the Vikings have run the team. Maybe we're digging out of the quagmire, maybe still treading water. 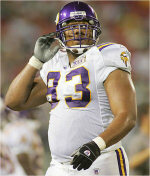 VikingPaul73 wrote: I thought he was the 23rd pick? Sorry, I was thinking of Barr at the same time. and apologies again. 9, 11,23.first rounder. Wth makes the difference. CbusVikesFan wrote: It's really too bad that we couldn't have drafted Shepard in later rounds. At least he was productive in his rookie year. I realize that he is not a speedster per se but seemed pretty solid to me. Diggs, Thielen, and Shepard would have made a nice trio. Then draft DD Westbrook this year. Being the OU fan that I've been for 40 years I can tell you Westbrook is a faster version of Shepard (who is a stud!). People concern themselves with where or not these smaller receivers can hold up physically in the NFL but man Westbrook would solve the speed issue, slot issue, is great on slip screens AND is an exceptional PR to boot! Ditto Westbrook. We'd be saying "Cordarrelle who?" in no time. Well, maybe in 4.3 seconds...lol. CbusVikesFan wrote: If Treadwell had/has the tools to be better than those guys he would have been out there. That's how I feel about it. He was the 11th pick in the draft for Pete's sake. Neither CP or AT are considered a number 1 wr even though Thielen played like one. CP has been here long enough to shine and didn't come close to expectations for where he was drafted. So you have to ask yourself was the pick worth the value. I say not until he proves me wrong, which my thoughts on Patterson were/are the same as Treadwell. Disappointed for sure. Treadwell was the 23rd pick. And Waynes was the 10th pick and if he had/has the tools to be better than Newman, he would have been out there and wasnt. His second year he was. Sorry but I don't buy that. I've said before, some people throw the word "bust" around way too much and it drives me crazy. Christian Ponder was a bust. He was given plenty of opportunity and was terrible. Thats a bust. Troy Williamson was a bust. Given plenty of opportunity and was terrible. Treadwell has been given next to no time and some are classifying him as a bust. It just baffles me. Not saying you're using the word bust because your not but let the guy get a shot before anyone starts calling him a bust. Remember when guys were calling Waynes a bust??? They took a shot at Jeffery but outside of that, they werent really pushing for a big #1 WR. Looked at some #4 guys but thats it. CbusVikesFan wrote: Sorry, I was thinking of Barr at the same time. Well there is a big difference. Although even a guy like Waynes that was picked at TEN didnt play much his rookie year and when he did, he didnt look great. Look at him this past year. Giant improvement. Give the guy a shot. Pondering Her Percy wrote: Well there is a big difference. Although even a guy like Waynes that was picked at TEN didnt play much his rookie year and when he did, he didnt look great. Look at him this past year. Giant improvement. Give the guy a shot. I'm willing alright. I think I said he was a disappointment. CbusVikesFan wrote: I'm willing alright. I think I said he was a disappointment. Just curious but did you consider Waynes a disappointment after year one? No, because I think that a db has more to learn even though he was a high pick. To me a wr should know his craft better and should be able to see the field off the rip. Diggs is a perfect example. Later pick, but saw the field almost right away and I knew he was going to be pretty good to start with. My question to you is how much do you think Treadwell will see action this year? Will he be the #1, #2, or #3 guy? Why do you think a WR should know his craft better than a CB coming out of college? Seems to me they're two sides of the same coin. CbusVikesFan wrote: Just curious but did you consider Waynes a disappointment after year one? Well I mean they do say CB and WR are the two toughest positions to learn coming in as a rookie. As for Diggs, yeah he played by week 4 or 5 but at the same time, who did he have to compete with?? We didnt think Treadwell had much competition outside of Diggs when we drafted him but then Thielen shot out of nowhere and CP became more involved. As for Treadwell, it depends what you define #1, #2 and #3 as. The way I look at it is in 3 WR sets, you have X (main deep threat), Y (possession type WR) and Z (slot WR). I would probably say Thielen as the X, Treadwell as the Y and Diggs as the Z. But when we drop down to 1-2 WR sets who knows. I would guess they would want Treadwell in there quite a bit given he's a great run blocker. But for 3 WR sets, I believe thats how it will shake out.